Useditem excellent working condition tested withseveral scrapes andscratches pictured. Will be sold exactly as is pictured. Up for sale is a pair of Vandersteen 2W subs in very good condition for their age. This price is for a pair. Original boxes. We specialize in well-cared for, previously used gear because that is what we are passionate about. We feel that there is nothing more fulfilling than creating a high-performance system on a budget with carefully selected used components, speakers and cables. Black cloth/oak finish. The Vandersteen VSM-1 is an advanced surface-mount loudspeaker that works equally well as a wall-mounted stereo speaker and/or the rear channel positions in a multi-channel audio/video system. They provide the power, dynamics and low-frequency detail required for superlative reproduction of music and film. In addition to assuming the responsibility for deep bass reproduction, both of these subwoofers dramatically improve the mid-bass and midrange response of any speaker system. Condition is Used. VLR Wood Specifications. Weight22 lbs. CrossoversFirst order/6dB per octave, 3.5kHz. Impedance8 ohms nominal 5 ohms minimum. Frequency Response64Hz – 21kHz /- 3dB. 30-100 Watts Into 8 Ohms. Pair of pre owned Vandersteen 2Ci speakers Comes with heavy duty floor stands. Consecutive Serial Numbers. These speakers sound amazing- a real treat for the discerning audiophile. Well taken care of. Has very littles signs of use. No tears in the mesh fabric. Local pick up only. Well worth a road trip! I HAVE THESE SPEAKERS LISTED LOCALLY AS WELL AND RESERVE THE RIGHT TO END LISTING EARLY IF SOLD LOCALLY THANKS. Speakers are consecutive serial #'s: 25336C & 25337C. There is a slight rattle in the rear subwoofer of speaker 25337C. I have used these speakers off and on for about 1 year. THESE BABY'S CAN SING! L hear you can find out by calling Richard vandersteen. Beautiful sounding pair of Vandersteen Model 3A Speakers with Sound Anchor Stands. I have the original manual and paperwork i got from the original owner. Little dusty but they have been very well taken care of and were driven by tube monoblocks. I have here one Custom Vandersteen VCC-2 Center Channel, Serial #1707. I am the original owner and have only used this speaker off and on for about 1 year. I can personally describe it as having a rich, pure and natural sound, the way music and cinema should be heard. Vandersteen Model 3 Floor Standing Speakers + Sound Anchor Stands. Pickup in Crystal Lake, IL. Vandersteen 2Ce Signature speakers with factory stands. Excellent condition. Local pick up only -- 70 lbs each heavy stands. I am in Santa Clarita, near Los Angeles. 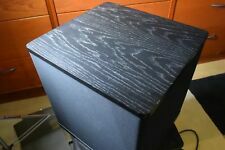 VANDERSTEEN 2CI SPEAKERS SoCal ONLY!!!! Both speakers have new socks sewn by my better-half. There's a slight pucker on the top back corners, but hardly noticeable. Two very good condition Vandy 2ci. The imaging and vocals are just wonderful. Hard to find audiophile speakers. Complete with stands (filled with lead shot as suggested for perfect acoustics.). These are heavy, so pick up in San Francisco, CA will be required. Home audio experts agree that the right speakers are essential to any quality home entertainment system. Vandersteen is a highly respected name in audio and has been making quality speakers and subwoofers for home use for years. 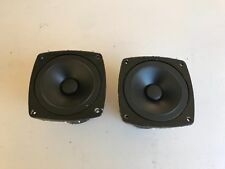 If you are interested in shopping for inexpensive Vandersteen speakers on eBay, check out the following common questions to gain valuable information. What speaker styles does Vandersteen manufacture? Tower speakers - These sit on the floor and are large enough to house multiple different speakers in an all-in-one housing. Bookshelf speakers - These are smaller versions, usually with a woofer and a tweeter. The compact design helps them blend into any room. Tweeters - Tweeters are rsponsible for the high frequencies in the sonic spectrum. They help provide sonic clarity to any mix. Woofers - These speakers transmit the midrange frequencies that carry a bulk of any sound's signal. Subs - Subs are non-directional and broadcast subsonic frequencies, giving audio a beefy low-end with no bleed. Do they have built-in crossovers? Yes, they do. The tower Vandersteen speakers are made with a built-in crossover, an essential device. The crossover is adjustable and determines which frequencies are sent to the high-end speakers and which are sent to the sub. Without a crossover, the audio's sound can become muddy and distorted because low-end frequencies are being sent to speakers that aren't powerful enough to handle them. Most Vandersteen crossovers have a 12dB range for adjustment. One important aspect when choosing a speaker is its outer design. The last thing you want is an unsightly speaker being a distraction from the decor of your home. Vandersteen speakers come in both black and wood finishes, allowing you to get a matching speaker set that fits the style of your home while still providing quality. Subwoofers, towers, and bookshelf speakers all come in both finishes. Are there accessories available for the speakers? Yes, there are. To improve the experience of using the speakers, there are some accessories available for purchase. The most commonly found one is a speaker stand. Stands are ideal for getting horns and tweeters up off the ground so that the high end can be broadcast effectively. Because subwoofers are nondirectional, it is not common to use a speaker stand with them. Content provided for informational purposes only. eBay is not affiliated with or endorsed by Vandersteen.